Six into five does go! 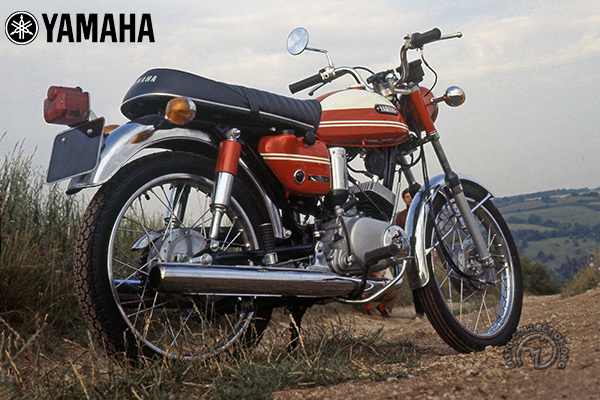 Yamaha marketed the AT90 in late 1965 in Japan, and it was, at that time, the smallest production twin. A mildly upgraded version, the 100 YLl Twin Jet, was exported in 1966. When Yamaha became World 125 Champion in 1967 and 1968, it was logical to exploit this victory. The 1967 AS1 soon established itself as the benchmark sporty 125. Only the Hondas were as powerful, and since they were much heavier, no other 125 could match its performance. Suzuki did not respond until 1969, in the shape of its T-l25 "Flying Leopard," whose daring aesthetics proved highly controversial. Besides being the first 125 twin two-stroke produced in large numbers, the AS1 was remarkable for having what its makers described as "five transfer ports" cylinders that were actually six-port cylinders, since two ports were siamesed! Despite the precise and delicate adjustment demanded by its engine, the AS1 did much for the marque's image in the West. However, it's racing career was modest. Backed directly by Yamaha, Jean Auréal won the 1963 French GP and Chas Mortimer the 1971 125cc TI. But the 1970 client kit, giving 23 hp at 14,000 rpm, was unable to match the works Suzukis, Kawasakis and Derbis. The 1970 AS2 was only available for a year and only offered a revised color scheme and longer wheelbase. It was the AS3 of 1971 that represented real progress, with some mechanical changes and a redesigned frame. The most original feature of the Yamaha ASl and AS2 (our pboto) was their tall, chromed air filter stacks.